Couldn't find a web page. Drove from the Dawson City Hostel, over the "Top of the World Hwy" to Grandma Shirley. This is another clean, quiet hostel located on the second floor of a private home. There are 9 beds in the co-ed dorm. By now I was getting more comfortable staying in co-ed dorms. There is also a small upstairs kitchen and seating area, along with a large, clean bathroom w/shower. Soap & shampoo included. Nice clean towels. Above Right: The bunks. I had the bottom. LInda had the top. The other bunks were occupied by 2 other women, and two men. Everyone was sleeping. I couldn't sleep so I got up and went to Wal-Mart, drove back to "Norht Pole" to mail post cards, then drove around Fairbanks to see what it looked like. I still wasn't used to the 24 hrs. of daylight. I got back to the hostel past midnight. Tiptoed around 'cause everyone was still asleep. Left: Kitchen area in the hostel. Got up early. 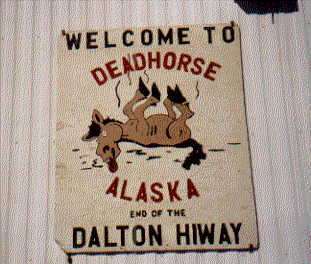 Went to the information booth to find out more about the road to Deadhorse. They suggested that I "forget about it" and take a tour bus as far up as the Arctic Circle. They said I'd need a truck or a 4-wheel drive to make it over "The Dalton Hwy". Well, tour bus cost too much. Plus it's too confining. I'd take my chances in my car and drive as far north as I could.